1. We both had a free weekend in the summer which NEVER happens! 2. We had saved this post a few months earlier about a waterfall loop in California and it was the perfect opportunity to check it out! 3. The price was right! We found an affordable little airbnb WITH a pool and we were sold! We drove to Redding on a Saturday afternoon and our first stop was this bomb smoothie place called Asis Juicery, definitely worth checking out if you’re in the area! Then we checked into our little home for the weekend, spent some time at the pool before heading out to find Mossbrae Falls. Let’s talk about Mossbrae Falls! Not the easiest to find, and when you research hiking to it a lot of people will tell you it’s illegal to be on part of the trail… but after a while driving around in circles we found it and we also saw police while we were hiking and they didn’t mind us (and the many other people) on the trail! It was green, full and so refreshing when we went. It’s also a unique experience walking along the train tracks overlooking the river! It was gorgeous and we 10/10 recommend! Finding Mossbrae Falls: If you put “Mossbrae Falls” into your GPS it won’t take you to the trail head… it will get you in the right town (Dunsmuir) but not even in the general area of the trail haha. You need to look for “Shasta Retreat” in Dunsmuir, CA and park along the road outside of Shasta Retreat. Walk down the hill into Shasta Retreat and turn right and head towards the bridge! When you cross the bridge turn right again and walk about 1 mile along the railroad tracks. If you start to hear humming, the training is close by so move to the side (you should also hear the horn)! Right before the second bridge (if you cross it you have gone too far!) is the waterfall, look through the trees and you will start to see it! The water is freeeeezing but you can swim in the falls if you want! 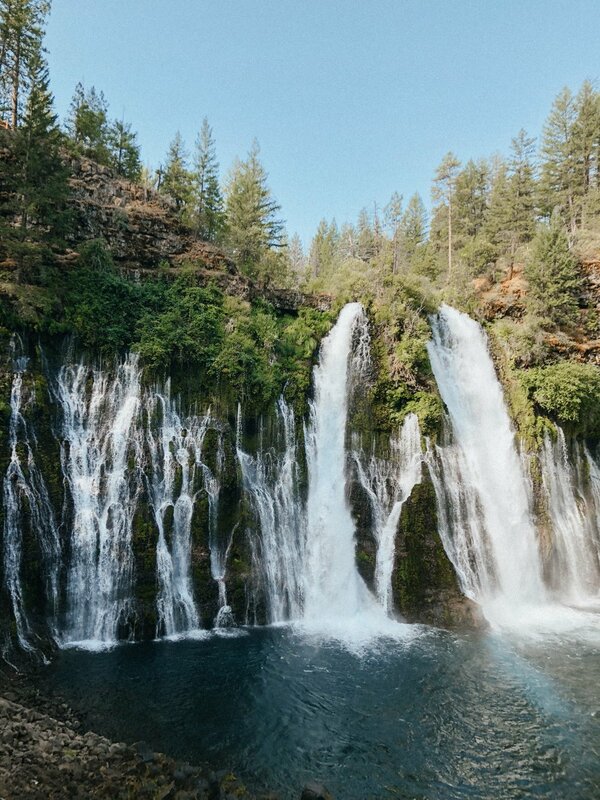 The next day we went to Burney Falls and Whiskey Town Lake before heading home. And you better believe we stopped back in at Asis for another smoothie bowl in between! Burney Falls was beautiful! You pay for a day pass ($10) when you drive in so you can stay and explore all the trails in the State Park or take the quick walk down to the falls. We went early because parking was limited and we didn’t want to share the falls with a bunch of other people! You can pay for a pass which allows you to park at certain beaches or you can find a spot along the road and walk down to the lake! We took the free route and parked along the road. This lake WASN’T freezing and the water was CRYSTAL CLEAR! Two bonuses for us haha. Bring your floaties, chips & guac and sunscreen because you will not want to leave this lake all day! 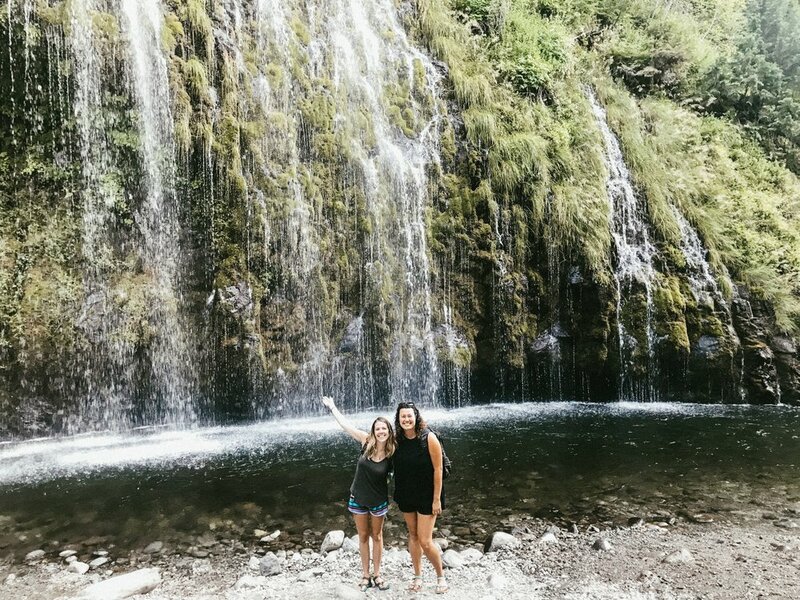 We loved really enjoyed this trip and if we had more time we would have done all the waterfalls on the list and also hopped over to Lassen National Park, Castle Crags State Park and Shasta - Trinity National Forest! 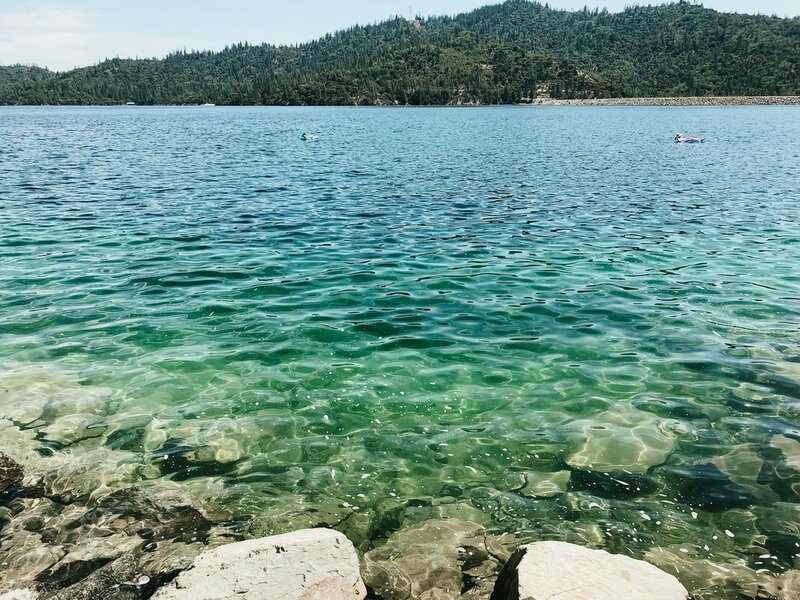 There’s so much to do in the Redding area, it’s definitely worth the trip.